Ten years after the explosions, Svetlana Alexievich, a Belarusian journalist and author, began talking to the survivors, including residents of the area and those who came to clean up. Their testimonies form this book. Alexievich stands back and lets the people speak. And an oral history of the disaster emerges from the monologues of those whose voices had not yet been heard. While it did not even have a nuclear reactor on its soil, Belarus has been the most affected by Chernobyl. It lost 485 of its villages and settlements. Of a total of 10 million people, some 2.1 million—or one in five, of whom 700,000 are children—now live on contaminated land. In the two regions that are closest to Chernobyl, mortality rates are 20 percent higher than birth rates. 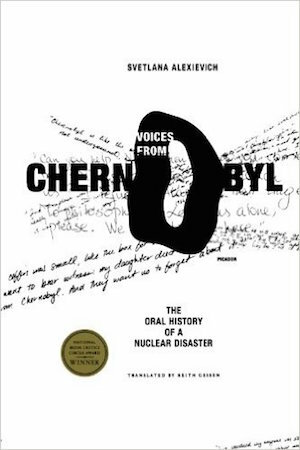 Through these individual stories, the author builds up an overall picture of what really happened, both during the Chernobyl disaster and its aftermath. What comes through is a suffering that is unimaginable and an unthinkable negligence on the part of the authorities. Many of the interviewees spoke of the beauty of Chernobyl’s landscape—and its stillness. As if even the birds knew something terrible had happened, and left. But radiation is an invisible and lethal enemy. Farmers living off the land could not understand why they had to milk their cows and then throw the milk away. Or why they could not eat the carrots and cucumbers they grew. Although the liquidators—civil and military staff who cleaned up—were asked to dig up the topsoil and bury it deep in the earth, keeping it away from the water table, this did not always happen in practice. The unquestioning faith of citizens in their state and their duty is striking. Those who were called upon to go to Chernobyl went without protest. People in the exclusion zone were not too concerned, initially. After all, if the situation was really so serious, would the authorities not have informed them? However, their faith did not survive Chernobyl. This book is not for the squeamish. On a physical level, there are graphic descriptions of what radiation can do to humans. Every pregnancy was a nightmare. There is a telling remark made by a midwife: “It was a long time since I had seen a happy pregnant woman”. Many women opted for abortions. Children who were carried to term were born deformed. On an emotional level, the stories are heartbreaking. Lyudmilla, for example, was married to a fireman who was part of the clean-up operation and was dying of radiation sickness. Through it all, she nursed him, refusing to leave his side, trying to protect him as best she could. “And they photographed him. For science, they said. I’d have pushed them all out of there!…How dare they? It’s all mine—it’s my love.” Those who moved to another part of the country were stigmatized. Listening to these stories—and it really does feel like you’re listening to them—is overwhelming. There were times when I felt numb because of the sheer volume of detail, told and retold. The author’s writing reflects the people as they speak, flat and repetitive at times, lyrical at others. Alexiviech has found a way to bring the disaster to life simply by listening to ordinary people who have seen it first-hand. In 2015, Svetlana Alexiviech was awarded the Nobel Prize in Literature “for her polyphonic writings, a monument to suffering and courage in our time”. And I can see why. The voices she records in her book stayed with me long after I finished reading it. The (superbly written) review is not for the squeamish either! Such a tragedy Chernobyl was. Sad beyond words.